This kale salad is made with 5 simple ingredients and is great on its own or as a side dish. In fact, it's the perfect side salad for Pressure Cooker Coconut Brown Rice Risotto with Vegetables and Shrimp! 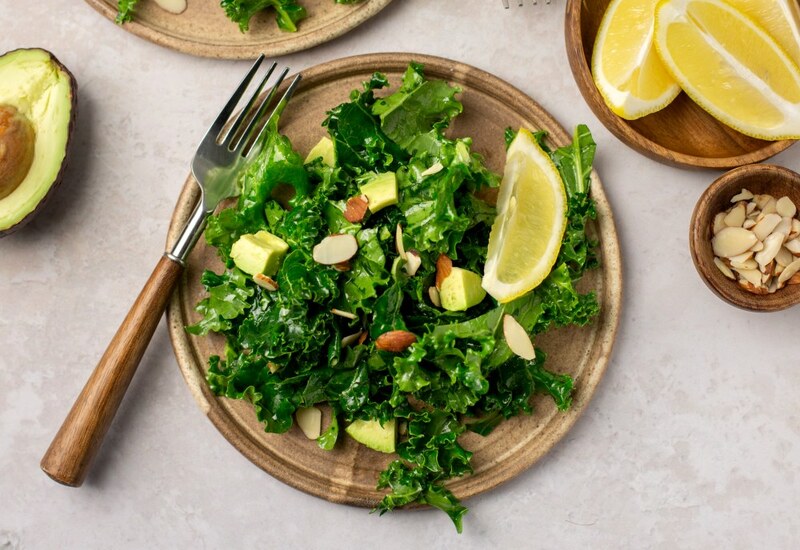 The mellow avocado and nutty almonds pair beautifully with bitter kale. Top this salad with hard-boiled egg or chicken for extra protein! To remove stems from kale, hold a leaf by the stem with one hand and place your index finger and thumb of your other hand around the stem where the stem meets the leaf at the base. Pull your fingers up along the stem to tear leaves from each side. Per Serving: 267 calories; 26g fat; 8.5g carbohydrates; 4g protein; 0mg cholesterol; 11mg sodium.